Destination weddings should be what you’ve always dreamed of — not a total disaster. That’s why it’s so important to work with an expert and not try to juggle everything on your own. In addition to the cake, florals, photography, and other details that may already seem overwhelming, you’re responsible for choosing a venue in another country plus adhering to that country’s legal requirements. With all this in mind, here are 9 mistakes to avoid to ensure you don’t experience a destination wedding disaster instead of your perfect day. This is the most valuable piece of advice: Your wedding is the most important day of your life. The person responsible for booking you and your guests should know what they are doing. Choosing a travel agent who is not trained or experienced in booking destination weddings — or someone who doesn’t enjoy it — is not as effective as choosing someone who has experience and loves what they do. A destination wedding is very different from other vacations. It typically includes a group of people with careful details to attend to: details that require attention such as arrival gifts, having rooms in the same area of the resort, and special dinner reservations, not to mention booking people on the same flight and making everyone aware of travel requirements. Not everyone wants to — and is capable of — handling a group booking. Our destination wedding specialists possess certain skills that make them exceptional at what they do. You don’t want to micro-manage your travel agent; let them do their job and advise your guests of the mandatory information. You also don’t want to deal with the supplier directly or play travel agent with your guests. Cancellation fees, flight information, and insurance are just some of the important pieces of information that if neglected, will cause destination wedding disasters. Clients who try to book their guests themselves online usually have a destination wedding disaster. You may also not be aware of promotions, complimentary rooms for the bride and groom, and important information like document validity and insurance options. If you let your guests fend for themselves, you may have people spread out all over the place: different blocks of rooms throughout large resorts, different flights, different suppliers (with their own luggage requirements, cancellation policies, etc. ), and even different resorts. Plus, people will pay different prices. You won’t be able to take advantage of complimentary rooms that are sometimes a perk of booking groups, and people won’t get to stay together which takes out some of the fun of travelling as a wedding group. Even if you end up at the same resort, understand that you may be at different sections of the hotel and your guestrooms could be far from each other. Waiting until the last minute to book may be an old-school tactic for saving money. Under certain circumstances, it can work: when there are few of you and you’re not picky about where or when you travel. Booking too late as part of a wedding group can be disastrous. There may not be enough room at the resort for you, in which case you’ll need a day pass to visit for the wedding ceremony and reception, plus incur any travel costs to get from your resort to the group. If you didn’t give your guests enough notice to come to your wedding, or if they didn’t give their deposits on time, you can experience a destination wedding disaster. It’s important to book your destination wedding as early as possible to avoid making mistakes while rushed. Keep your guests in mind when selecting a destination and hotel for your wedding. After all, they are investing money and time to celebrate with you. Note what time of year works best and what sort of budget everyone is working with. Also make sure you consider their children — and whether or not you’re looking at an adult-only resort or resorts where kids can stay and eat free. 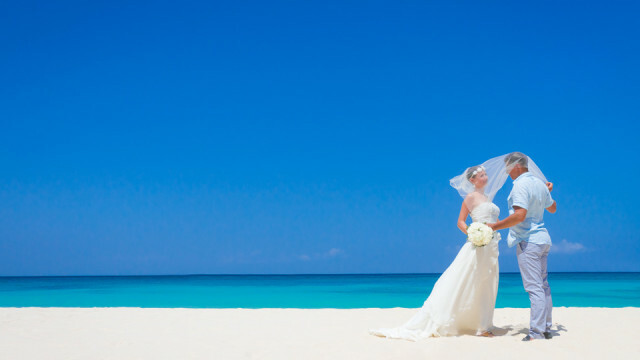 Typically, couples don’t expect gifts when they have a destination wedding. But if you’re asking for a traditional gift registry, make sure it’s pre-arranged to be delivered after your big day so people don’t have to lug gifts on vacation and you won’t end up with all this stuff to bring home. Or, consider having no gifts at all or making a donation since your guests invested so much in your wedding already. During the holiday, organizing one or two group activities is nice, such as a rehearsal dinner or excursion, but don’t book your guests up with activities all week. Remember, it’s their holiday too! The wedding coordinator is usually a complimentary service at your resort — so why wouldn’t you take advantage of having someone take care of the details for you? This person knows the ins and outs of the resort. They have knowledge in regards to currency, wedding permits and licenses, the resort grounds, and local vendors. This is their full time job. No one can communicate the vision of your perfect day better than you. That’s why having your travel agent (or as we learned, your “destination wedding specialist”) act as the middleman between you and your wedding coordinator can cause your vision to get lost in translation. The resort’s wedding coordinator is there to work directly with you. And, even if you don’t make any of the mistakes in this post, your wedding coordinator could be a real lifesaver in the case of an unforeseen destination wedding disaster. Not being aware of documentation that is required, how far in advance you were supposed to arrive, and other legalities can result in a destination wedding disaster. There are many marriage laws to be aware of: witnesses, marriage licenses, blood tests, etc. You’ll want to work closely with a destination wedding specialist to iron all this out and not be blindsided when you arrive, only to find out you can’t actually get legally married in destination. Hurricane season takes place in the Caribbean from June to November. If you can’t even fathom what would happen to you if it rained, let alone thunder stormed on your wedding day, then you may want to reconsider your wedding dates. If you’d like to save some dough and are laid-back and can go with the flow, then if it does happen to rain on your big day, the resort will help you find another locale like an a la carte restaurant, or delay your wedding depending on availability. Bring printed copies of what you’ve signed up for, from vendors, wedding planners, and any other contact you have been in touch with for services. If a problem arises, you’ll have proof that you discussed it and what you agreed on. Having photos to look back is an important reminder of the best day of your life, and tradition of wedding days. If you choose to hire a professional photographer to capture your favourite memories, don’t skimp out — and we’re talking about money and time. Not taking time to research local vendors (or if you’re bringing your own photographer from home) can result in wasted money and lots of tears when you realize you don’t love any of your photos. If you’re bringing a photographer from home (some resorts do not allow this), research the best way to fly with your equipment and the VISA requirements of working in your wedding destination, unless you’re keeping it low-key. (We recommend bringing limited equipment if you’re coming as a photographer). If the resort allows you to bring your own photographer, get written confirmation so there are no problems that day. If you are using theirs, make sure to request a portfolio from past weddings to make sure your vision matches up. What’s your advice to avoid destination wedding disasters? Comment below.